In the first article in this series, we walked through creating a site in Windows Azure Websites and deploying a PHP web service to it. This PHP service exposed three important endpoints: getting a collection of points of interest, getting a shared access signature (for uploading files), and adding new points of interest. 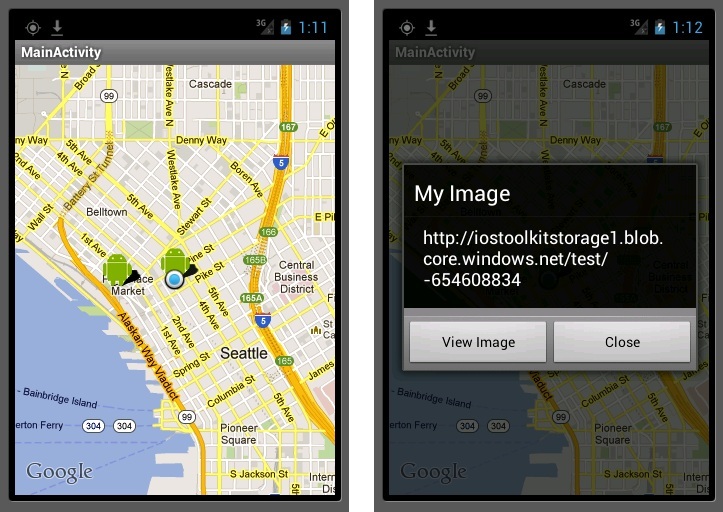 Today we’re going to build an Android client that is capable of displaying a map with these points of interest on it. We’ll also poll the user’s current location in the application so they will see all the points of interest around their current position. in the next few articles, we’ll continue to talk about how to add new points of interest. If you would like to jump ahead and just pull down the source code, you can access it in this GitHub repository. Note that you’ll still need to follow the instructions in the readme and configure your app. We’ll be using Eclipse for this tutorial though if you use a different IDE to work with Android, you should be able to follow along without too much trouble. Now that we have our app, let’s work on the UI. E/AndroidRuntime(1559): Caused by: java.lang.IllegalArgumentException: MapViews can only be created inside instances of MapActivity. Before we continue on to the code, you should also add the android.permission.ACCESS_FINE_INTERNET. Here we’re handling creating the overlay, adding items, and tapping those items. The only really interesting thing to point out is the onTap(int index) method. When the user taps an item on the overlay, we create a dialog with a title and description and two buttons. The first button when tapped, will launch the web browser with whatever URL has been set into the description. Later when we display our points of interest, we’ll use the URL tied to each one for that description. This gives us the ability to show whatever image is tied to a point of interest. The second button just closes the dialog. First we are getting references to our UI objects. We turn on the zoom controls on the map using setBuiltInZoomControls so the user can manually zoom in and out. We initialize the drawable to an image in our resources folder (I’m just using a little Android guy which you can download here). We fetch the collection of the MapView’s overlays and then add a new GeoItemizedOverlay. That overlay is used to display the points of interest. 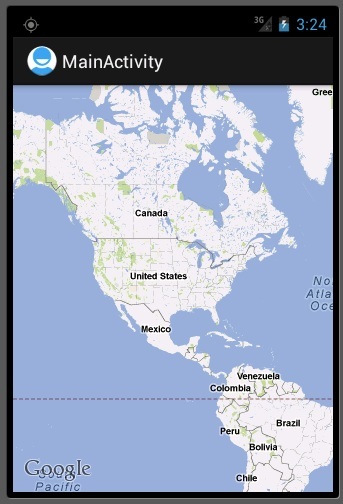 We’re also adding a MyLocationOverlay which we use to display only the user’s current location. For that overlay, we also call enableMyLocation so it knows that it should draw the user’s location on it. 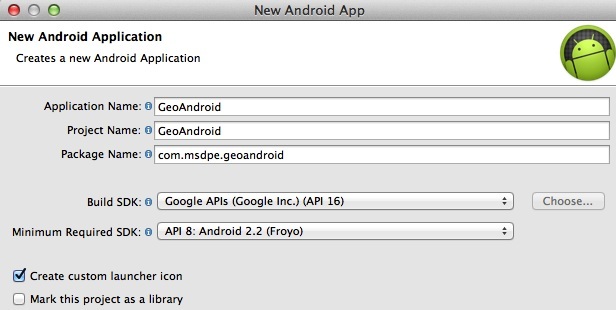 Lastly, we get a reference to the LocationManager which we’ll use a bit later. Continuing in the onCreate method, we create a LocationListener which just calls the onLocationChanged method whenever it receives an updated location. That listener then calls the makeUseOfNewLocation method in our activity. The first thing I’m going to point out is that the network communication here is done on the MAIN THREAD! This is bad. So bad in fact that in later versions of ADT and Android, it won’t run. They really don’t want you doing network traffic on the main thread. For simplification purposes, I’m doing the code on the main thread but you should look at using either an IntentService or an Async Task to accomplish pulling the points of interest from the server, and then call invalidate on the map in the callback. The first thing we’re doing in the method is building our URL using the constant we added earlier and then tacking on parameters for the latitude, longitude, and the radius in meters that we want points from. We then hit the server using HttpUrlConnection and read the results back into a StringBuilder. This is turned into a JSONArray which we then loop through to grab the latitude, longitude, description, and url for each point of interest. We generate a GeoPoint from the position and create a new OverlayItem which is then added to the itemized overlay. That’s all there is to adding these points to our map. Now if you run your application (on the emulator), you will just see the normal map initially. 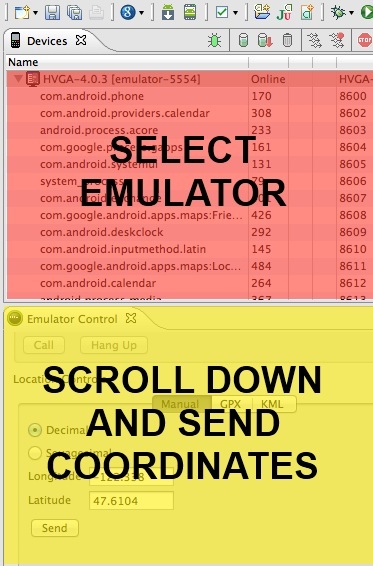 The reason for this is that the Android emulator can’t grab our position like the way a device can. Luckily, there are a couple ways to send the GPS coordinates to the emulator. The first way is to return to Eclipse and go to the Window menu and choose Open Perspective and DDMS (you may have to go to Other and find DDMS if it isn’t listed). With that don you’ll be taken to the DDMS tool. There is a lot that you can do with DDMS but we’re going to focus on setting the GPS coordinates of our device. Now when I run and set my location to Seattle, the emulator shows the blue dot where I’m at and then pulls the near by points, which are shown with the little Android figure. If I tap on one of those points, an AlertDialog pops up giving us the ability to view the file attached to the point (the code for this was in the GeoItemizedOverlay class). In the next article we’ll discuss how to add these points of interest. 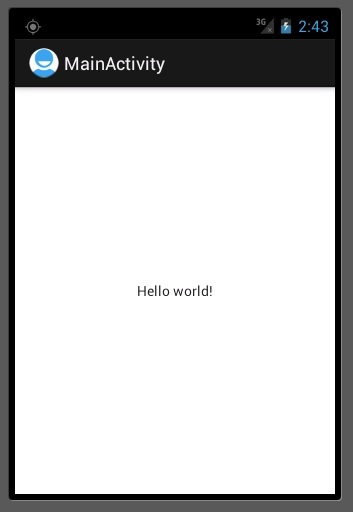 Today we walked through creating a simple Android application that will connect to a PHP service running in Windows Azure Websites and poll for geographical points of interest. We then display those points of interest as points on a map with more information provided when tapped. As I mentioned at the top, you can access the full version of this app on GitHub. Remember that you’ll need to configure the subdomains in the Constants class before trying to run it.